Create advertising that actually works by generating an impressive return on your investment? If so read on because I’m about to reveal a highly effective, yet easy to use marketing tool that could seriously revolutionise how you approach your marketing. Hone your marketing message so it appeals to a specific someone as opposed to a generic everyone. AND best of all, they refer you to their friends, say nice things about you on social media and help market your business via word of mouth. What’s more, if you look even closer, these people will often have common demographics, values and motivational drivers. Then compare this with other customers on your books who only buy once, are more demanding and make you feel uncomfortable or unsettled. I bet you’ll find these people don’t share the same profile as your core group! So whilst your business could theoretically serve anyone, which group would you most like to work with on a consistent basis? With a detailed customer avatar in your business toolbox you’ll be in the minority. That’s because most business owners will not make the effort. And as a result you get to work a brilliant competitive advantage. Filter out the sort of person you’d rather not work with etc. In addition, instead of guessing the most effective marketing media, or simply using the format that everyone else is trying, you can choose the method you know your target customers are most likely to look at. And as a result you’ll increase your conversion rate, attract more of the right customer AND avoid burning money on advertising that simply doesn’t work. Please don’t miss this opportunity to seriously improve your business marketing. 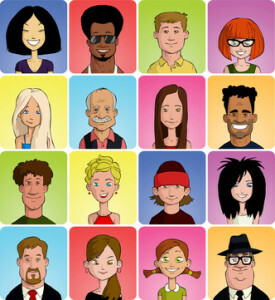 Instead download your free template now and use it to work on your customer avatar. Just click here. Then once finished, give your avatar a name. Even better find an image that best represents the person you’ve described. Next pin your avatar up somewhere prominent in your working space as a constant reminder of who’s the right who for you. Develop a new product or service etc. Make the effort to get into the shoes of this person and visualise their perspective. What do they need to know? What could they struggle to understand? What objections might they have? etc. And what impact could that have on your bottom line? Thank you this is exactly what I was looking for. Great article. hi Chris, great stuff. I’m glad you found it useful. This is so important, if not the most important part. Hi Agnes, thanks for your kind words. I hope you find the checklist useful. Thanks for the info – once I released the worry of not having enough people to serve if I ‘only’ served one niche, I now am able to spend my time on the right people. What a difference and a freedom. Makes business SO much simpler. Hi Sheena, that’s a very common fear – but it’s often unnecessary when you realise the number of people out there you could help – if only you targeted them more tightly. I strongly believe there are people who I can best serve. And like others, I’ve had some not such good experiences when customers have not been a good match. It’s well worth getting clear on who you want to work with because that makes what you do all that more enjoyable. Thanks for this – looks very helpful. Great idea for a template. I look froward to learning more from you! That’s great to hear you’ve found this useful Tim. Brilliant! I originally heard about how to develop the avatar from John Jantsch’s book “Duct Tape Marketing” which I definitely recommend. Your template definitely helps to streamline the process! Thanks! Hi Simon, great stuff. I’m glad you found the template useful. Knowing your audience is certainly hugely important if you want to communicate with relevancy and authority. Bringing this article back to life in September 2017. This is such an awesome post and it helped me craft my email newsletter. I’m working on creating my client avatar and helping my clients understand and create theirs too. It’s more effective to focus on a particular type of client than shout buy, buy, buy to anyone who’s listening. Thank you again for such an awesome explanation of this. THANK YOU so much, everyone keeps saying create your avatar and I just didn’t know where tp start. This really helped me mind dump so thank you thank you.